Any knappers out there worked it? I have heard it called "Cryalot" by the local knappers. It is hard to work but the Native Americans seemed to be able to do it just fine. I don't knap but lots of guys around here that do use rhyolite because it is our local knapping rock. 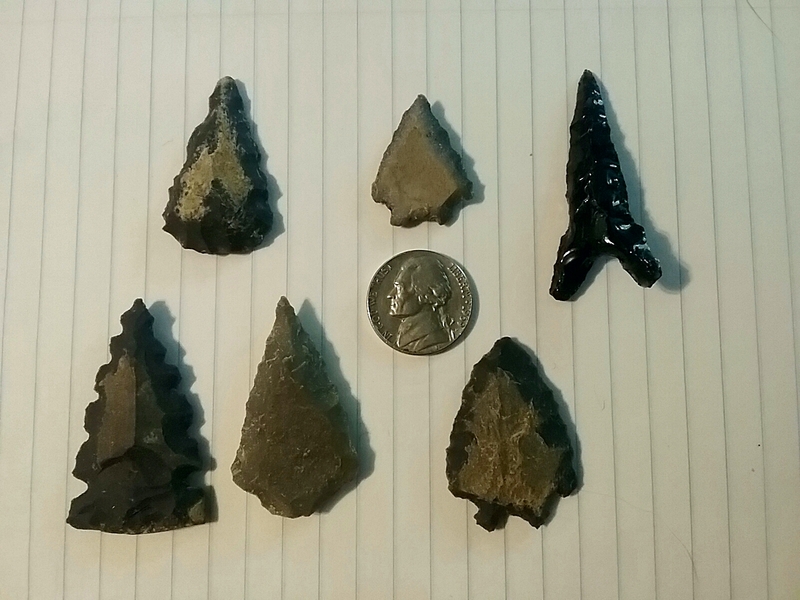 Rhyolite arrowheads and blades are very tough and hold up better than many other types of stone. The greenish rhyolite is finer grain and although as tough is easier to work I think. James Parker(huntworthyproductions) has worked tons(literally) of rhyolite and is as good of a knapper as I have ever seen. James lives up near Boone. Pat, are you going to Linda Brittain's shoot at the end of the month? Powder Creek? Here is my feeble attempt. I have not figured out how to get a good spall off local rock, so finding chips and trying to pressure flake them is my effort at this time. The black one is not local. It is obsidian. Bud: You taking up this hair pulling craft? lol Let me know and I will send you some slabs to work and learn on. I wonder if heat will tame your rhyolite a bit and make it easier to knap. I have heard it will not, unless you have a kiln. And even then most that work it regularly say no. hence the nickname cryalot. Bud, I'm planning on going to the Powder Creek shoot. It's been a few years since I've been there. Usually I would have a primitive skills weekend at my place but I had to cancel this year. I always waited until Linda scheduled their shoot before I set my dates. My event was originally scheduled for this coming weekend but like I said above I had to cancel. Thanks Pat. I may try to make it. Several years ago we had two guys at a local club to teach knapping. One of them knapped a rhyolite knife and the other one from obsidian. After completing their task, the guy with the rhyolite knife looked at the other guy with a "I dare you" look, and then threw the knife into a tree. The guy with the obsidian knife looked like he was about to be trapped, but couldn't back away. He threw his knife and the obsidian broke into several pieces. Don, was that James Parker with the rhyolite? Sounds like something he'd do. Yes, it was James Parker. You can probably guess the other guy also. He ran will James for several years and was a good student. Usually a good rhyolite knapper has developed strong arms and forearms. It takes a lot of strength and skill to be really good at it. They also work with much larger Ishi sticks. You are right PatB. It was his brother-in-law Vincent. They were good together back then.